Packing, protecting and posting goods is made simple and stylish with Sancell Black Ärmour side opening padded mailers. The opening on the longest edge of the bag makes packing items a breeze. Specifically designed for use in a bulk pack and post setting, Sancell side opening padded, bubble mailers will help you have your goods out the door and on their way quickly and safely. 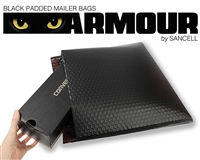 Sancell black "Ärmour"side opening padded mailers offer 100%block-out to ensure privacy and discretion in transit. They feature tamper evident seals ensuring your goods arrive at their destination intact and undamaged. Sancell padded mailers are a versatile pack and post solution for any business.